Why do we so love decorative bowls? A new fix for your addiction: make your own paper mache bowls. It's cheap, easy and you can change up your looks in a snap. Painted with rose gold or bright designs, these bowls make great presents. Skip the ceramics and make paper mache bowls instead. They’re fun to create and great for holding jewelry, the mail, trinkets and even art supplies. These even make a great, easy project for kids! It only takes 30 minutes, plus 24 hours to dry. Cut up your newspaper into 1-inch strips. Make your paper mache paste mixture by mixing together one part flour and two parts water in a large bowl. Stir it well until it's a smooth, thin consistency; you are looking for a consistency similar to pancake batter. Grab a kitchen bowl to be used as the mold for your paper mache. It can be whatever size you'd like. Tip: glass is easiest to clean. Completely cover the outside of the bowl with aluminum foil. Lightly spray the outside of the foil-covered bowl with cooking spray. Dip the strips of newspaper into the paste. Wipe the strip so it’s not dripping wet and apply it on top of the bowl. Repeat this process with the newspaper strips, laying them in different directions until the whole bowl is covered. Allow the bowl to dry overnight. Once completely dry, carefully pop the paper mache off the bowl, separating the foil carefully. 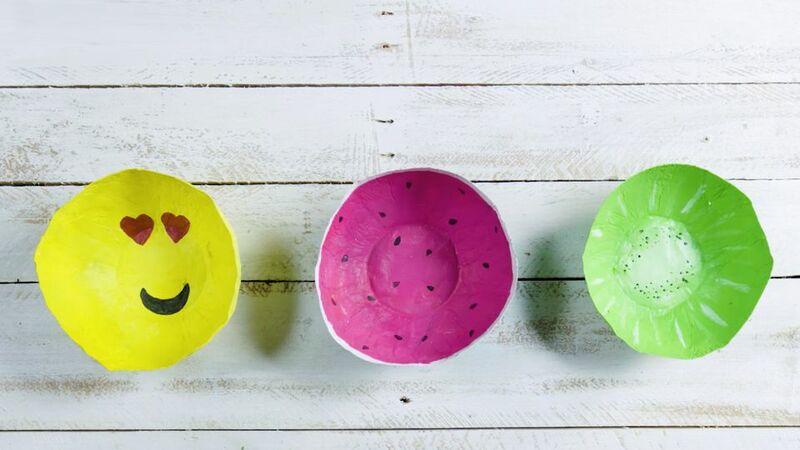 Use acrylic paints to decorate the bowls any way you like.